Franklin's Service is a STAR test and repair station. We meet the high standards set forth by the Bureau of Automotive Repairs for performing smog checks in California. Schedule your biennial or change of ownership inspection with us today. Learn More about our smog check ? Find new tires with the click of your mouse. Select your vehicle information above to see all tires that fit your make and model of car, light truck, or SUV. Our inventory includes famous brands like Cooper, Nitto, and MICHELIN®. 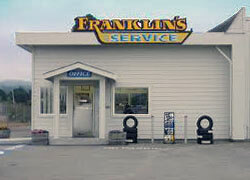 For years, Franklin's Service has helped local families get safe performance out of their vehicles. That's over six decades of tire sales, preventive maintenance, and automotive repairs for drivers across Arcata, McKinleyville, Eureka, Blue Lake, CA, and all of Humboldt County. Locally owned and operated, we continue our legacy of honest work and genuine service each day. We employ ASE-certified technicians and stock the best in auto parts and products, like JASPER engines and transmissions. Don't forget to ask about our nationwide warranty good for 24 months/24,000 miles. Arcata's only Smog Inspection Station? Call (707) 822-1975 to schedule an appointment with our team today, then see us at 1903 Heindon Rd. Arcata, CA 95521. If you're experiencing an automotive problem and would like answers now, try our online diagnostic center. We look forward to earning your business by providing a level of service that will keep you coming back. Read the reviews drivers have given us after service, or share your own experience to help our collection grow.